Fruit trees have been popular in Australian Gardens for hundreds of years. Depending on the climate zone literally 100s of varieties can be grown both commercially and in the home garden. One of the most popular ways to buy deciduous varieties is as bare rooted stock online in the cooler months when dormant. With new and improved varieties finding their way onto the market now is the time to plant a home orchard. Literally 100s of varieties are available for sale online from specialist growers. Dwarf fruiting varieties are suitable for growing in large pots. while grafted varieties are grown on a stronger or disease resistant root stocks. Usually grafted onto a ‘dwarfing rootstock’ dwarf fruit trees are very popular in the home garden, many now available for sale are suited for growing in pots and containers. Trees are grafted for a number of reasons, usually they are grafted onto a more resilient rootstock. And of course onto dwarfing rootstock. They are also ‘multi grafted’ more than one fruit on the one tree. 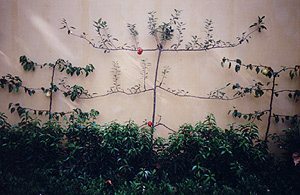 Espalier varieties are excellent for limited space and growing on walls and fences. Potted varieties can be planted at any time of the year. The best time is in early autumn, the soil is still warm, so you will get some root growth before winter, and the trees will have time to settle in before the first summer. You can also plant in early spring. In warmer climates where you get wet summers, spring can be a good time to plant. We provide access to growers of dwarf , multi graft , citrus trees and fruit salad trees, tropical , sub tropical, cool climate and temperate fruit trees, vines, climbing fruiting plants, multi graft fruit trees and dwarf fruit tree varieties. In Australia, Climatic areas for growing fruit fall into four main areas, Tropical, Sub Tropical, Temperate to Cool and Mediterranean. The types and varieties of fruit trees that can be grown in each area varies significantly. For Sub Tropical Areas try. Acerola, Jabotica, Grumichama, Persimmon, Strawberry Guava, Papaya, Tamarillo, Banana, Sapote, Cherimoya. but can be productive space savers. Fruit Trees are popular both as commercial crops, small orchards, backyards and in home gardens. Part of the Australian Landscape since early settlement with cultivars coming to Australia with settlers. Apple, Plum and Lemon trees are the most common in the home garden. However we now find a greater variety of fruiting trees, grape vines and berry fruit available than ever before. With high quality trees available to suit most climate areas of Australia growing a fruit tree is not only popular but also provides us with fresh produce, to eat , preserve and share with family and friends.